Sometimes the simplest meals are the most delicious. This recipe only has a few ingredients and can be prepared in less then 5 minutes. It is my favourite summer meal. Arrange tomato and cheese on plate. Sprinkle with chopped fresh basil. Drizzle with oil and vinegar, add salt to taste. 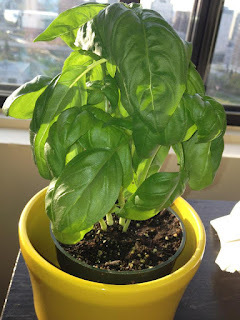 I got a basil plant so I used fresh basil! Hopefuly I can keep it alive.